China is, on cue, about to initiate on March 26, their famous Petro-Yuan deal (which they have postponed several times). The Petro-Yuan leads into the Petro-Yuan-Gold deal, where the oil exporters will be able to turn Yuan – which they don’t need – into gold. Now, gold is NOT the only alternative, but after the USA is conquered and its dollar worth no more than the scrap value of the cotton-paper it is printed on, gold will have value. One more verse should be perhaps touched on here, and that is Daniel 11:43. The “he” is the King of the North. This is the same King of the North that valued gold and silver in Daniel 11:38. Although other scriptures also show that gold and silver will have value around this time (like Revelation 18; 9:20), the Bible is clear that gold and silver will be worthless for a short time before Jesus returns, e.g. Ezekiel 7:19. One side note is that, in Egypt, major gold deposits were found in 2006 (A Gold Mine Worth LE 23 Billion (and counting). Egypt Today, August, 2006). This is relevant as it does prove that Egypt now has enough gold that a foreign power could be interested in taking/using it as Bible prophecy teaches. Under the Donald Trump Administration, US debt has risen and we are seeing much international interest in gold. After Donald Trump said the USA would cut funds to Pakistan, that government announced its intention to trade in Chinese yuan (see Pakistan to trade in yuan while launch of petro-yuan draws nearer). China in preparing to launch yuan-denominated oils futures contracts. According to some news agencies it may be allowing yuan-based oil contracts in Shanghai Stock Exchange as early as March this year. The move has consequences going far beyond the economic domain. Hitherto, the US dollar has had the monopoly over oil contracts as it enjoyed the status of the only currency in which major oil contracts could be made. This meant that US could get away by having a 20 thousand billion dollars budget deficit as it could print the dollars backed by “black gold”. What does it mean to challenge America by competing against the ultimate economic tool, the petro-dollar? As the prospect of petro-yuan becomes a reality, China will, in effect, be making a claim to global oil reserves. That would definitely be against American interests as the “black gold” has been practically backing the US dollar as well as humungous US debt. Globally, if you needed oil you definitely needed to have dollar reserves. These dollar reserves could never be materialised unless goods and services made it to American economy or in some cases through expats sending foreign exchange to their home nations. Most global dollar reserves depend on export from dollar starved nations to American consumers. These reserves would always land back in American economy through the banking system. Again, the same dollar would have to be competed for globally by offering goods and services to American consumer as the world is in perpetual need of oil for most of its energy needs. That means that all the economies have to be constantly running for dollar while the US could print at ease in the name of national and foreign debt. China has been trying to come up with systems, including with gold backing, to avoid the US dollar. So, there are some questions as to how well this will work. But it is an attempt by China to gain more economic influence in the world. 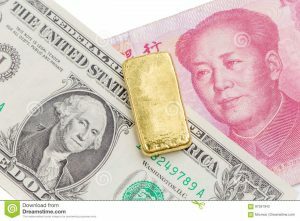 Although China’s gold-petro-yuan will NOT be the final replacement to the US dollar as the world’s primary reserve currency, the “gold-petro-yuan” is a step that will weaken US dollar dominance. This entry was posted on Sunday, March 25th, 2018 at 3:00 pm	and is filed under Prophecy.